As I mumbled to the good doctor over at Dimensions “and one more thing I want that prescription please” she chuckled. She probably wasn’t laughing at me… actually maybe she was, since she said “Oh, we’re there already?” After the quizzical look I gave her she clarified, “I’m just surprised it took you this long.” Yeah, it’s been a long time coming, but we all get there when we’re ready. I wasn’t ready then, but I’m ready now. Here it is: my shiny new prescription for Testosterone. 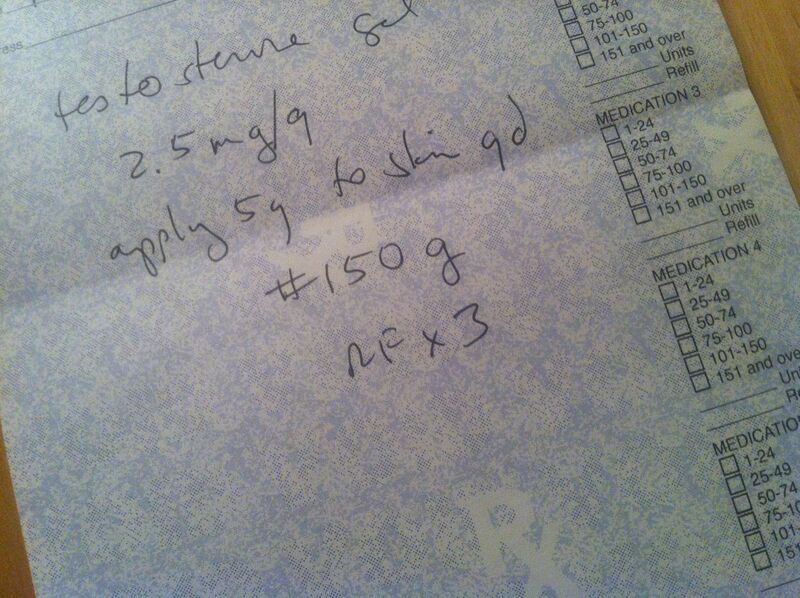 Please ignore the prescription amount. The pharmacy gave me cream and not gel, so while it's an approximation, I really have no clue how much I'm taking. Indeed, this whole question around testosterone has been plaguing me for quite a while. I was surprised to find the exact musings of this past month echoed in the archives of some ancient posts I wrote a long time ago. For almost a year now, not only have I been outlining the pro’s and con’s, examining each and every possible outcome, and meticulously mulling it over and over and over and over again – I hadn’t yet come to a definitive conclusion. Nor have I, still. And that’s the magic of hormones. They aren’t an all or nothing kind of thing, like surgery. You take a little bit, observe; take a little more; observe some more. Days, weeks, months, or even years later, if and when you’ve reached your goal, or you freak out, you simply stop. True, some effects are not reversible, but for me the big NO-NO’s are very clear, while the Yes’s and Maybe’s are fuzzier. And hormones are fuzzy. This I discovered with the help of a friendly therapist I’ve been seeing during my break (because even though I was on a blogging break, my thoughts did not stray far from this gender business). This is my first time in therapy (that actually counts), and honestly I’ve found it quite helpful. It’s not about having a mind-blowing revelation each week; rather, it’s just comforting to hear these things from someone other than me. There’s reassurance in having my thoughts and instincts validated, in hearing that my ongoing doubts are real – but not catastrophic – and in realizing that if I truly think it through, step-by-step, I already know the answers. Let’s go back to how long I’ve been considering testosterone. The fact that my interest hasn’t waned in so long is an indication that this is more than simple curiosity. There is something that keeps drawing me to it, something I want from it, something that I need. When I sat down to think about it, however, I came up empty. I don’t really need Testosterone, I’d say to myself. Because yeah, in a void, I don’t inherently desire anything it provides. For starters, I am utterly confounded as to why or how people see me as a female, since there is nothing there to indicate that I am one. But there is not much to indicate I am male either. And I’d much rather be perceived as not-female than as female. Which leads me to the only other option: being perceived as male. Now, this is not about actually being male, or being perceived as male. It’s simply tilting the scales towards non-femaleness. In my case, approaching a sort of androgyny of this kind requires some de-feminization, which roughly translates to masculinization. Is this a need? Is this justified? It doesn’t matter. It’s enough that I want to do it. For me, it has more and more become a need – not a physical need, but a social need. So I’m going to take it day by day, week by week, month by month. If at any point I see the tiniest sign of something I’m not comfortable with, or my hesitation crosses a threshold, I can stop, and that’s that. If at any point I see that my body is changing, and I’m happy with the changes, or I don’t mind the changes, and I notice that people are perceiving me differently, I can keep going. When the ratio of perception shifts from 80/20 to 60/40, or to 40/60, or to 20/80 I will smile on the inside, because that is indeed what I want. And if testosterone is going to get me there (and therapy is nudging me along), so be it. That’s so awesome, congrats on this huge step! Do keep us updated, I’m in the pre-prescription stage of things and desperately wanting to move forward. I’m so excited for you! I’ll definitely keep you updated – after all, it’s what I do here! I’ve recorded some video/audio, but I’m quite shy so it’ll probably be posted whenever I have enough to do a “mashup” or side-by-side comparison of changes. Congratulations! I hope that you get the progress you want from T and don’t see anything you don’t want to. Congrats! And good luck, hopefully it will give you the results you are hoping for! Congratulations! There does come a point where all you can do is try it and see how it goes. Everybody is different, every body reacts differently to T. It’s clear you’ve thought about this for a long time and you’re prepared to see how it goes with an open mind. And of course while there is some risk, even the ‘irreversible’ changes can be masked or removed in same way a trans woman would when transitioning. The deserted island thought experiment is a really great way to think about the difference between physical and social dysphoria. I try to find a balance so my day to day self is the comfortable me I’d be on a desert island and not something where I’d have to put effort into performing a gender role to ‘pass’. That’s only possible because I went through some aspects of ‘transition’, but it’s also why I stopped and didn’t go all the way on some other aspects because I was ‘passing’ too well. I’ve read about other’s experiences of non-binary people (namely yours) of almost going “too far” and being uncomfortable with it. At the same time, when I saw you and heard you in the videos you’ve posted, it made me want to at least _try_ and get to that androgynous sweet spot where you really are right smack in the middle. Because right now, I’m not there yet. Alas, I don’t think I could ever “pass too well” unless I grow a full beard, and I won’t let it get to that. Indeed it is all an experiment. We’ll see! Dude this is like the story of my life! I will be starting T next month. I was on it before when I was 21 (am 28 now) and stopped cause I was having other health issues and thought it was the hormones, and like so many years later found out it wasn’t and now I’m healthy and ready to start again and can’t wait. So congrats, I can’t wait to be at the point where you are and post the shiny prescription note on my blog too. The prescription is only the beginning! It’ll take more than a few weeks before I start seeing any changes. But yeah, it’s exciting. Best of luck to you. i love the desert island exercise! it’s a great way to discern between body dysphoria and social dysphoria. my whole problem is dealing with my social dysphoria; i feel like i don’t REALLY need to fix it, but you’re totally right that “we don’t live in a void”. i’m excited for you! i look forward to reading about how it’s going; i wish awesome-ness your way.